Can't figure out what to get someone? Grab one of these and let them pick something from our large selection of flying disc products and accessories. 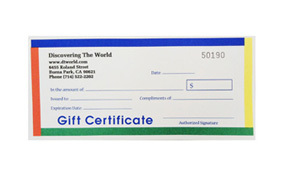 Just type in the amount you desire once you've added the gift certificate to your shopping cart. There is no shipping charge for gift certificates. Average Customer Review: 3 of 5 Total Reviews: 102 Write a review.